How to hire an Ayi (Maid) for Housecleaning Services in China? Download this bilingual China Maid Service Agreement template now! We support you by providing this China Ayi Maid Service Agreement template, in case you want to make a contract with a maid or nanny for housekeeping services! What does an Ayi cost in China? Due to the scarcity of 'good Ayi's', their salaries in China are generally higher than most of the other industries (think about 28-40 RMB per hour when they are working for foreigners, and 25-35 RMB / hour when they are working with locals) (Shanghai, 2018, for other cities, like Beijing, Guangzhou, Xiamen, etc it's probably lower). By using this bilingual Ayi Services Agreement you will certainly save yourself costs and efforts and it's a great tool to make all your wishes and demands clear in order to have a long and successful agreement with your Ayi. It is drafted by a local legal professional, contains all the basics, is intelligently structured and easy-to-navigate through. 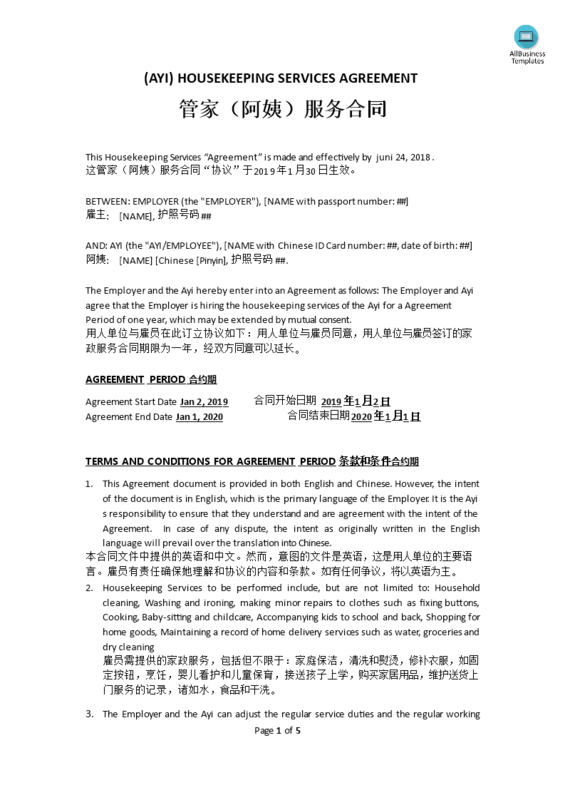 Download this China Ayi Maid Service Agreement template now!